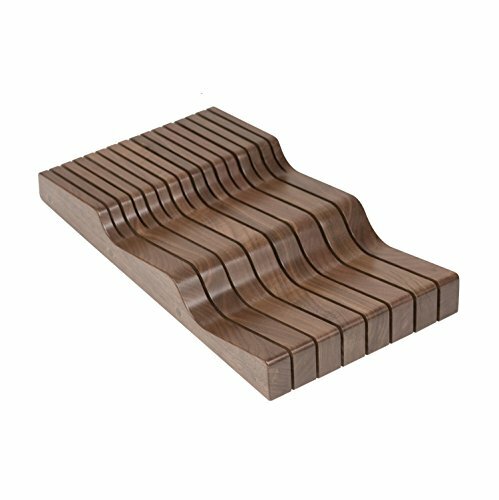 Wood Knife Block Tray Wave - 15 Knife Slots - 9"W x 16-7/8"D x 2-1/8"H. This unique wave design has a beautiful aesthetic appearance that can store an additional level of knives in a compact space. Century Components Riviera Collection RIVWKB90PF is made from solid walnut wood with a double clear cote 60 sheen conversion varnish sealer finish for great appearance, quality and durability. KNIVES NOT INCLUDED. Is exactly what our customers anticipate of our unique kitchen cabinet accessories. Each is handcrafted in the USA by skilled Amish wood crafters in Ohio. The Amish are well-known for a simple, honest lifestyle and dedication to preserving the skills of the past through generations of family. The Amish emphasize strong family, community, and a passionate work ethic. The Amish are recognized for quality, value, and beauty of workmanship by maintaining traditions that support personal attention to detail and use of high quality materials. Each product in this series is constructed from Solid Walnut. It has a natural color and graining, and is quite smooth with tremendous strength and durability. Each product has a double clear cote 60 sheen conversion varnish sealer for long term wood protection with a beautiful finish. Century Components designs a comprehensive line of cabinet accessories for discerning buyers. We still believe in the shop bench made way of thinking, making each product one at a time. In addition to this product we offer additional specialty pull out-organizers, filler space organizers, pull-out waste systems, lazy-susan, double tier drawers, utensil and silverware trays, knife blocks and more. We hope you enjoy many years of fine use with each of our family crafted products. If you have any questions about this product by Century Components, contact us by completing and submitting the form below. If you are looking for a specif part number, please include it with your message.